Masonic ribbon from the 32nd Degree of the Scottish Rite. Cross-shaped metal with a double-headed eagle at the center. The cross is black enamel with gold-colored metal trim around the edges. The eagle is made of gold-colored medal. 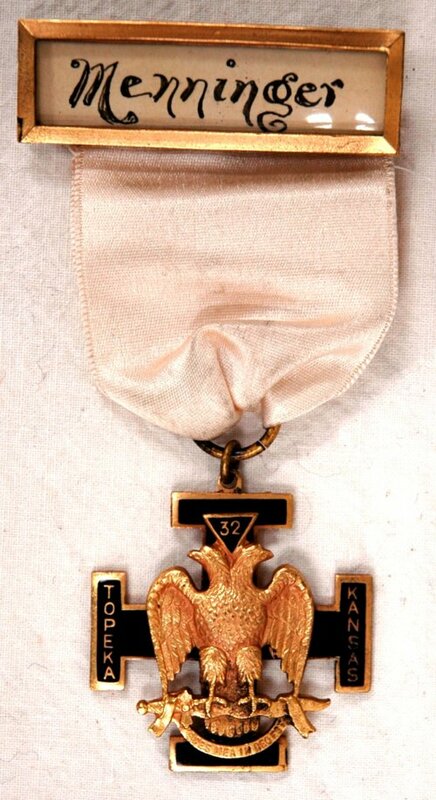 The top of the medal is attached to a short length of off-white silk ribbon. The ribbon loops through a ring, which in turn is attached to a jump ring on the top of the medal. Top edge of the ribbon is hemmed to a rectangular-shaped nameplate. The nameplate resembles a medal frame with a plastic-covered opening. Behind the opening is a slip of paper with the name "Menninger" handwritten across the center. Bar pin with hook-like clasp on the back of the nameplate. Maker's mark at the center of the back of the medal.